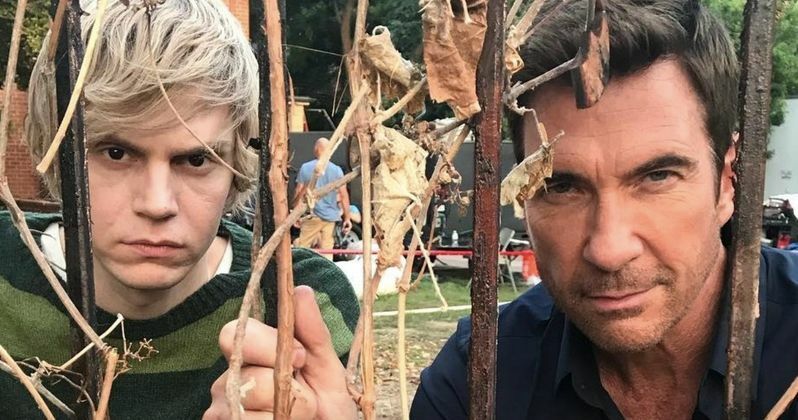 Dylan McDermott and Evan Peters took a break during the production of American Horror Story: Apocalypse to share a picture of themselves together in character in front of the Murder House. The new picture comes just days after show creator Ryan Murphy shared a picture of McDermott, Connie Britton, and Sarah Paulson from the set. Paulson appeared in both Murder House and Coven, so she'll be pulling double duty, with even talks of a mysterious third character as well. Everything seems to be shaping up just right for this AHS crossover event. Apocalypse will be taking Seasons 1 and 3 and bringing the storylines and casts together. In addition to Dylan McDermott, Evan Peters, Connie Britton, and Sarah Paulson, the returning Murder House alumni includes Jessica Lange, Frances Conroy, Lily Rabe, and Taissa Farmiga, who like Paulson, will be on double duty since she appeared in Coven as well. It isn't clear at this time if Rabe and Conroy will be playing two roles as well, since they were also in Coven. Joining Paulson, Rabe, Conroy, and Farmiga from Coven are Gabourey Sidibe and Emma Roberts. The Coven cast reunited on the set of American Horror Story: Apocalypse along with Fleetwood Mac singer Stevie Nicks. Ryan Murphy shared that photo a few weeks ago, which really got fans excited for the new season. Nicks will more than likely only be in the new season for a cameo. As to how all of the deceased characters will be coming back, the Murder House storyline pretty much means that anyone can come back, even if they're playing the dead. It will be very interesting to see how these two worlds are able to merge when all is said and done. Both Coven and Murder House had pretty different endings from each other. Coven ended with the witch school opening to the public while Murder House went out on a rather gloomy note with the impending arrival of the Antichrist. As for other behind-the-scenes shots, Ryan Murphy also shared a picture of Evan Peters as Tate in the Murder House and a picture of Emma Roberts as Madison amongst some bones around the yard of the Murder House. The good news is that we don't have to wait very long to see how both narratives are woven together, since American Horror Story: Apocalypse premieres on September 12th. American Horror Story: Apocalypse is going to break the mold for the AHS universe and could light the way for more seasons coming together to create one big monster show. The AHS franchise has received a total of 28 Emmy nominations and has won four times over its previous six seasons with Jessica Lange winning for Outstanding Supporting Actress and for Outstanding Lead Actress, James Cromwell winning for Outstanding Supporting Actor, and Kathy Bates winning for Outstanding Supporting Actress. You can check out the latest behind-the-scenes looks at American Horror Story: Apocalypse below, thanks to Dylan McDermott's Instagram page.